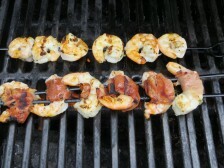 Rebecca writes: I know it’s a quick turnaround, but I want to grill some shrimp tonight. I have tomatoes and greens from the farmer’s market and a pretty full pantry. Any thoughts? Tony’s take: Plenty, but, first, the shrimp: the question is to peel or not to peel shrimp before grilling. Peeling can lead to tough, rubbery flesh. But the shell of unpeeled shrimp can block smoky flavor from advancing (and make for messy dining). What to do? I generally pre-peel; I’ll take flavor over texture any day. But (and this is a big but), you can have it all: wrap peeled shrimp in strips of prosciutto before grilling and you get a lighter, summery version of “larding“: the prosciutto both crisps up and encloses the shrimp, all the while leeching off its salty intensity. The addition of the cured ham might require another trip to the supermarket, but it’s worth it. Pair these “wrapped” shrimp with slices of tomatoes and dressed greens and you get a Mediterranean inspired meal that’s simple, but kinda fancy. 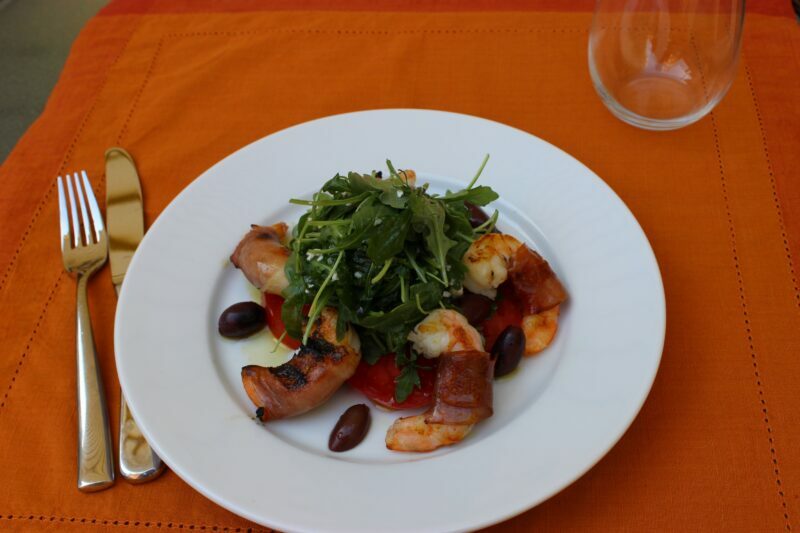 The pairing: Summer tomatoes and greens go perfectly with the shrimp. Sprinkle meaty slices of tomato generously with olive oil, salt, and fresh herbs so they sort of marinate. Pair with a salad of dressed greens (I used baby arugula), some crumbled feta, and black olives. Top the salad with the shrimp just off the grill and they’ll wilt the greens and bridge all of the different flavors. Shrimp: At the market, shrimp are classified by how many make up a pound. I like 16-20 count for grilling, large enough to hold up to high heat, but not so large that they’re obscenely expensive (the larger the shrimp, the more prized). look for wild caught (Gulf or Florida pink) shrimp which tend to have a meatier texture and cleaner flavor than farm raised. 1. Get prepped: Light up a medium charcoal fire or heat a gas grill to medium-high (not too hot, or you’ll burn the prosciutto and shrimp). Meanwhile, peel and devein 1 1/4 lb. shrimp (preferably 16-20 ct), rinse with cold water, and pat dry with paper towels (make sure the shrimp is completely dry so it browns nicely). Sprinkle lightly with S+P (about ½ tsp. each) and 1 tsp. chopped fresh thyme (or rosemary). Set 4 oz. prosciutto (thinly sliced) on a cutting board. Cut the prosciutto in 2-inch strips (about the width of the shrimp). Wrap the prosciutto around the shrimp and secure on skewers. Slice the tomatoes between 1/4 and 1/2 inch thick and spread on a large serving platter. Drizzle with 2 Tbs. olive oil (use the good stuff if you have) 2 Tbs. red wine vinegar (about 1 Tbs.) and another 1 tsp. fresh thyme or rosemary and let sit . 2. Grill the shrimp: Set the shrimp on the grill and cook without touching until they start to brown and easily release when you lift up an edge, about 2 minutes. Flip and cook the other side until the shrimp brown lightly and become just firm to the touch, about 2 more minutes. Transfer to a platter. 3. Assemble the salad: In a large bowl, toss 5 oz. baby arugula (or spinach) with 4 Tbs. olive oil and 2 Tbs. red wine vinegar. Season generously with S+P to taste. Add 1 cup feta and 1 cup Kalamata olives. 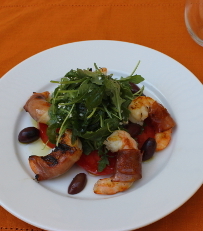 Set the tomatoes on 4 large plates, top with a mound of the salad, and then arrange the shrimp around the perimeter. Drizzle generously with olive oil and serve.